Two powerhouse teams met in Game 1 of the second round of the Western Conference playoffs. One prevailed. Most of the time when an NHL team fires 48 shots at a goalie, they can expect to maybe get a few goals... or more past him. Not tonight... not this goalie. 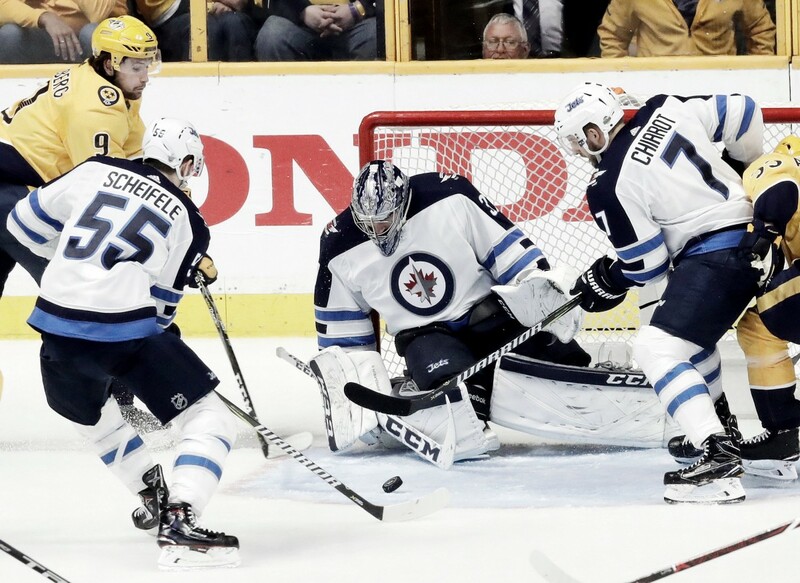 Connor Hellebuyck of the Winnipeg Jets stopped all but one shot, and carried his team on his back to come away with a Game 1 victory in the second round of the Western Conference playoffs against the Nashville Predators. Mark Scheifele pitched in with two goals to pace the surprising Jets performance. He might be player that Nashville needs to keep the puck away from as he has an amazing 37.5% shooting percentage in the playoffs. With both Hellebuyck and Pekka Rinne have been nominated for the coveted best netkeeper award, but tonight it was Hellebuyck forging ahead with a stellar game which caught the most attention. In the first period he had 20 Nashville shots fired at him, and probably felt like he should have received combat pay! He stopped every one of them, and that could have very well been an indication that the Predators were not going to penetrate his net much... if at all in this initial second-round contest. In fact, Nashville must wonder what they need to do to solve Hellebuyck since they led in every statistical category in the game. Faceoffs were 35-15, powerplays 3-0, hits 29-22, to go along with the staggering 48-19 onslaught of shots. Yet, Hellebuyck prevailed and got plenty of help in front of his net when needed. Even being outshot 20-4, the opportunistic Jets found a way to gather the first score of the game on this persistent effort by Brandon Tanev who found himself in the right place on the left goalpost to convert a rebound past Rinne at 14:51. The first stanza ended, and the Jets took a sigh of relief as they came away with a one-goal lead. It could have and literally should have been much worse. Paul Stastny put his team up 2-0 at the 9:01 mark, and the Preds had to start wondering what they needed to do to score a goal or to stay in this game. The Jets Mark Scheifele then went to work and gathered his fifth playoff goal in his last three games. This is one wicked shot, and he is one outstanding forward for the Winnipeg club. Scheifele placed his shot strategically by Rinne giving him little if no chance of stopping it. The Jets made the best of their mere 19 shots by making them count. The Predators pulled Rinne after the second period in favor of Juuse Saros. He faced only two shots in the third period. After shutting out the Minnesota Wild in his last two playoff appearances in the first round, the Nashville club finally ended his streak of 163:00 minutes of shutout goaltending. Kevin Fiala became the player to penetrate Hellebuyck's red line early in the last period at the 1:23 mark. A fine touch pass from Kyle Turris opened up the left side of the net and Fiala made no mistake to finally get the Preds on the scoreboard. It was as they say... too little too late for the Predators who looked out of synch in this game but will certainly regroup for Game 2. They will need to attempt to gain back their home ice advantage by winning on the road in Winnipeg. The Jet's put salt in the wound when after Nashville pulled Saros in favor of a sixth attacker Scheifele tallied an empty-net goal with 35.6 seconds remaining in the period. Jets lead the series 1-0. Game 2 will be Sunday at 7pm ET in Nashville. Will the embarassed Predators rebound. They really can't afford to go down 0-2. What do you think was missing in the Nashville Predators' Game 1 performance? Maybe some luck? Let us know in the comments section below.